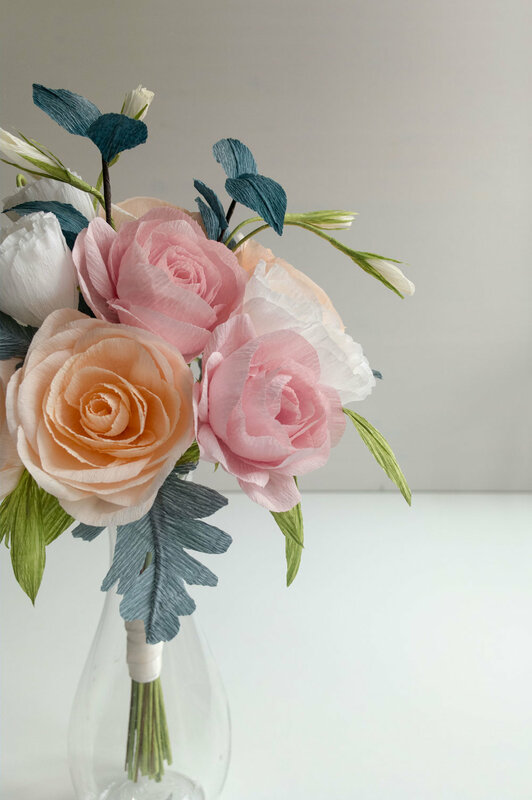 A Palette-able Creation: Garrett & Camilla’s Paperversary Reveal — Paper Rose Co. I wrapped up this gorgeous Paperversary bouquet back in March. 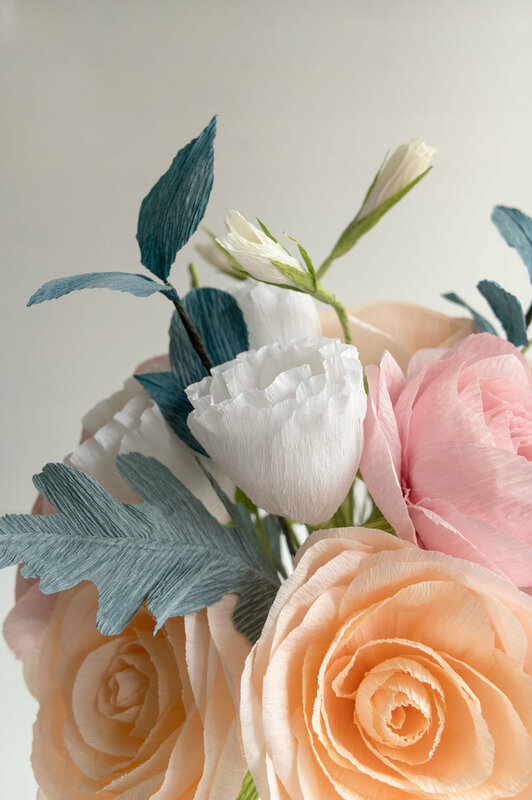 As soon as I got the word that Garrett had gifted it to Camilla, I just had to share a little preview on Instagram—its Spring palette bringing a little hope for warmer weather and blooms on the horizon. Apparently, I wasn't the only one who found the unique color combination appealing. Soon after my post, I was contacted by Jessica, the creator of Design Seeds, asking if she could use my image on her blog. I was ecstatic. I've been a long-time fan of Design Seeds and its vast catalog of inspirational color palettes and swoon-worthy photos. Just a couple of days ago she posted the palette she created with my image—and perfect timing now that I have time to share the rest of this gorgeous project with you! See post on Design Seeds for palette values! 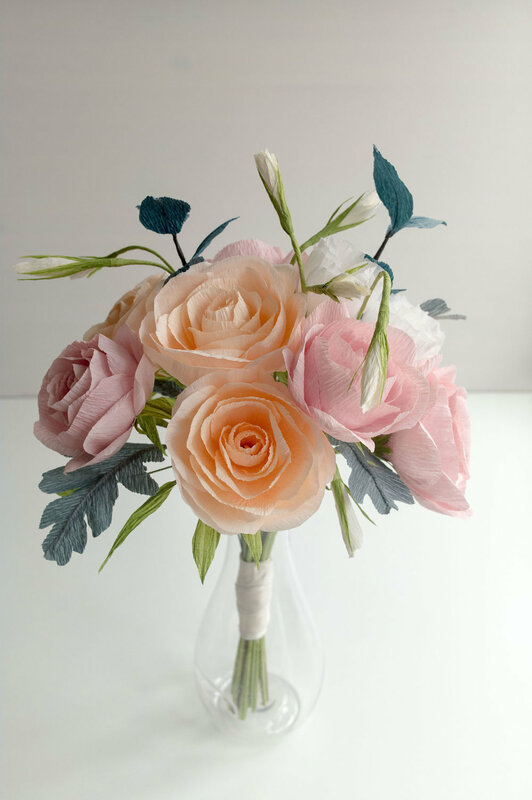 The bouquet used a combination of pale lavender, blush, and peach roses, white lisianthus blooms and buds, Dusty Miller, silver dollar eucalyptus, and some extra foliage that I couldn't quite identify, but tried to match as closely as I could. Naturally, those stems were my favorite part! Garrett happily informed me that Camilla "was so surprised and excited about the whole concept being brought to life and never imagined it." He also filled me in on the fact that she had lost track of her original bouquet during their reception, and that this gift was even more special to her because of that fact. And that's why I love these projects! Not only to get to make gorgeous flowers, but I get to hear stories like this. I couldn't be happier. Thanks again, Garrett and Camilla for letting me play a part! Here are more photos of this stunning arrangement (and the original, shown above). What is your favorite part? And what color is your favorite? Mine is the gray. Which reminds me I'm due for a restock! Time to buy more paper. Always! Lots more of these posts on the horizon. Stay tuned!